Hotel Lanzarote Village is a family friendly all-inclusive property just seven minutes’ walk from fabulous Los Pocillos beach within the sizzling resort of Playa Del Carmen. This elegant hotel, equipped with wonderful guest amenities and rooms with superb ocean views, invites guests to relish a fun-filled beach vacation with friends and family with a cordial reception. Situated opposite the beach of Los Pocillos, the property has lots of restaurant, bars, restaurants and shops in close proximity. In addition to comfortable and cosy accommodation, you get access to a beautiful pool space edged by a sun terrace with sun loungers and parasols, it is a beautiful space for enjoying a leisurely nap. After you start loving its laidback vibes, there is a wide variety of activities to indulge in too. From lawn tennis and table game to darts and games room, there is lot at the hotel to keep guests of all ages busy. 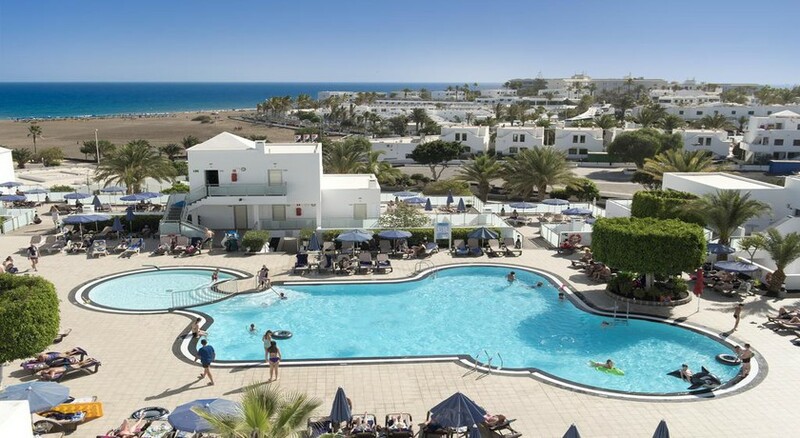 This hotel is just 6km, a short drive away from the Lanzarote Airport. The property lies right at the centre of the resort, simply across the coastal road from Playa De Los Pocillos beach, located 800m away. There is an abundance of marvellous bars, restaurants, nightclubs and shops in the neighbourhood. Public transport facilities are a short walk away. Lanzarote Golf Resort lies at a distance of 3.6km. 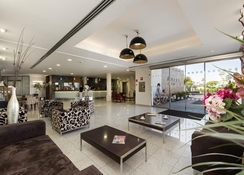 The Hotel Lanzarote Village hotel has 198 spacious double guestrooms, furnished with contemporary décor and the best of guest amenities for a comfortable stay. There are also 11 junior suites, two family rooms and four rooms for physically-challenged guests with wheelchair accessibility. The rooms provide excellent sea or garden views and have attached private balcony/terrace to enjoy the views. The rooms come with two-twin and one sofa bed, en-suite bathroom with a bathtub or shower, hair dryer, toiletries, climate control, satellite TV, telephone, Wi-Fi (chargeable), mini fridge, a safe(chargeable) and tea/coffee maker. The hotel has Bed & Breakfast, Half Board and All-Inclusive options for guests. 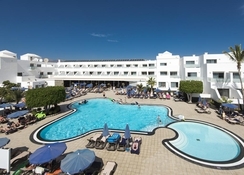 Hotel Lanzarote Village has a buffet restaurant with show cooking and a cocktail bar with live shows and music and a beautiful terrace that overlooks the pool space to dine. Its varied buffet serves up typical Canarian dishes in addition to Mediterranean and international dishes; themed buffets are organized several times over a week. All the dishes are quickly prepared with the most effective ingredients and a few are cooked live (show cooking). Head to the lovely cocktail bar, where you can enjoy your drink with daily live music. Bronze to your heart’s content by the hotel’s pool, or relax within the bathtub or with a massage. Guests can take advantage of the Hotel Lanzarote Village’s table games, ping-pong, darts, beach volleyball, bocce. Additionally, you'll be able to rent a bicycle at the reception and cycle on the sunny coast or explore the resort at your own pace. There's also a games area and playground for young guests. For those willing to stay active, there are aerobic exercise sessions and a gym. The nearest golf course is just 3.6km, a short walk or drive from the hotel.